Our own organic strawberries - worth the wait! Ann Arbor chicken supporters have the last peep! The strawberries keep coming! Something is nibbling the leaves on my newly emerging beans, but thankfully the strawberries seem to not be as appealing to this critter. I am distressed about the beans (I did plant many extra seeds though, just in case), but I am enjoying and savoring the strawberries. 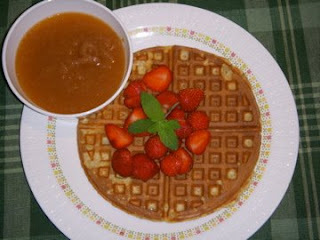 This morning I made waffles from scratch for breakfast and served them topped with freshly harvested organic strawberries and home-made organic applesauce that we canned last fall (my husband just found another 12 quarts tucked away - we vow to get organized this year!). I looked at the box of organic multi-grain waffle mix on my pantry shelf and was surprised to see the first ingredient listed as wheat flour, not whole wheat flour, just wheat flour. Bummer, I wonder why I bought it, I wonder what it cost. Well, I'll use it up sometime I suppose, but today I took the time to make waffles from scratch using healthy ingredients (very inexpensive compared to the box mix which still needed to have the expensive ingredients, eggs, oil, and milk, added anyway), made extra to freeze (using rule #1 from my post with the recipe for spicy lentil patties earlier this week), and then after eating but before cleaning up, did something I have not done for years and years. I made my own waffle mixes (since I had all the ingredients out on the counter anyway) to be ready for the next time I want to eat freshly made waffles with fresh berries or local maple syrup. Time invested in making my own mixes was way less than 5 minutes with ingredients I already had on my pantry shelves. Mix wet ingredients in a medium size bowl until well blended. Stir dry ingredients in a separate bowl with a fork or whisk until ingredients are well distributed. Stir dry ingredients into wet ingredients just until well blended (do not overmix). and as our guest to dine.